Muruga Nayanar was born in Pumpukalur/Thirupukalur, one of the flourished lands in Choza Kingdom. He was born in a family of Vedic scholars. He was a zealous devotee of Lord Siva – Lord Agnishwara. He worshipped Lord Siva with the flowers of enthralling fragrances. He collects fresh flowers of alluring fragrances in the early morning hours and makes beautiful garlands out of it. He found boundless joy in embellishing the flower garlands on the phallus. Muruga Nayanar made a regular practice of walking through the hills and woodlands before sun rise, chanting the divine names of Lord and immersed in His thoughts he walked through the length and breadth of the woods. He collects plenteous flowers, he makes attractive garlands, enthralling flower coronet to decorate the phallus and abundance of flowers to beautify the place of Lord. Nayanar lived an ascetic life, with the austere life and self –less devotion to Lord he realized the eternal wisdom – God realization. Muruga Nayanar’s unconditional love towards the Lord had provided him the opportunity to be close with the saints Thiru Gnana Sambhandhar and Thirunavukkarasar. 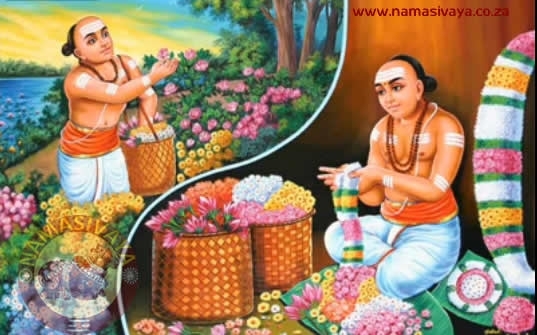 Muruga Nayanar compassionately received the two holy men with due honor to his home in Pumpukalur. Nayanar had the greatest blessings in the form of take part in the grand wedding celebrations of Thiru Gnana Sambhandhar. Finally, Muruga Nayanar attained the Abode of Lord Siva in Thirumanam, an astounding flame originated from the Lord while Thiru Gnana Sambhandhar earnestly sung praising the glories of Lord. The Tamil month Vaikasi – Moolam is widely celebrated as Guru Puja Day to commemorate the above incident.